The 3rd ESO students started with a conection with India and inspite of the different times, everything went right, breaking the ice and starting with the activity. 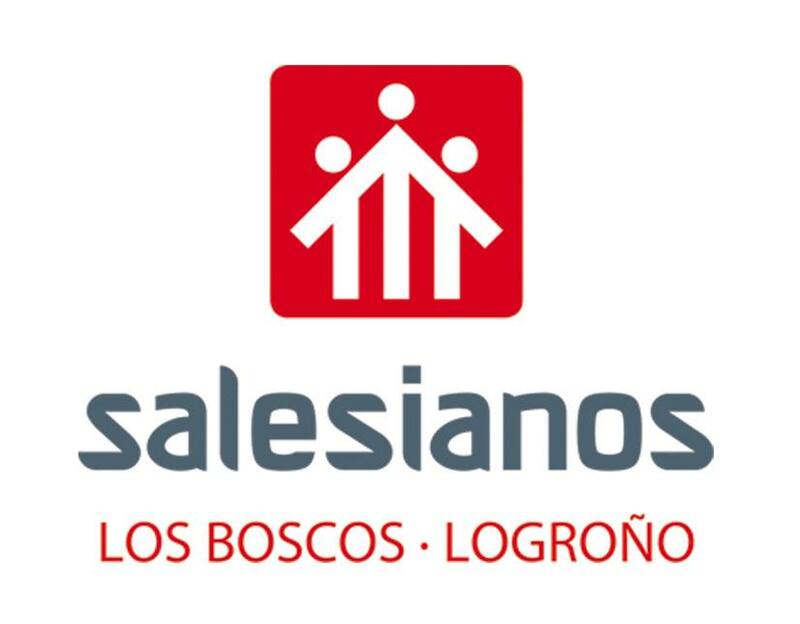 4th ESO continued and connected with the United Arab Emirates. 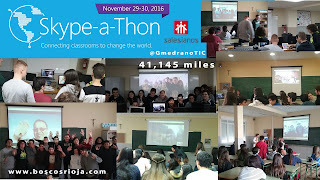 2nd ESO spoke with Malasia and FPB had th opportunity to talk to Qatar and Nigeria. The second session took place in the afternoon and evening with a mixed group of FPB, 3rd and 4th ESO, who came voluntarily with the objective to participate in more conferences and conections and continue with the great experience they had in the morning. They spoke with Sweden, USA, the Philipines and Canada. Hi I´m Alberto of 3º ESO, I like this experience and I want to repeat it again. I like very much this idea from the teachers because we can talk with other people from another country. When we do all in class I pass very good because is a funny game to find the country of the people, also the other people are very funny. In my opinion the experience is very good because it is very funny and I have learnt a lot of things. I really enjoyed talking with ppl from other countries through skype. 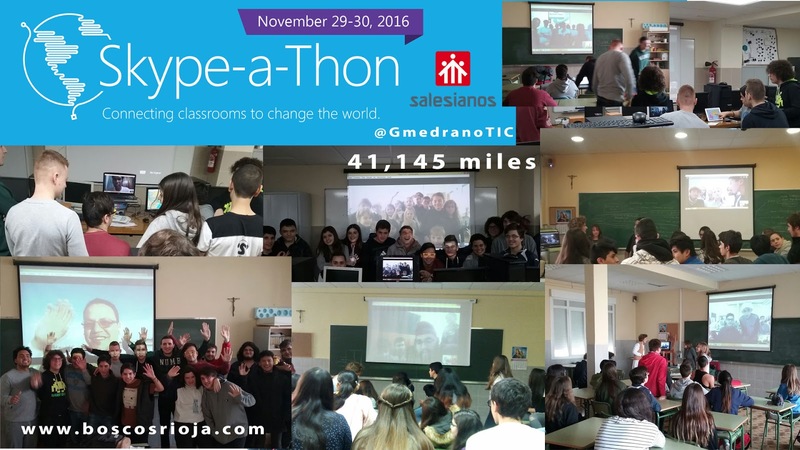 I'd surely repeat that but I missed skypeathon because didn't have time and I couldn't come. Hi,I´m Cristina of 3ºESO. I think this activity was very funny we had a great time and now my partners and I know more things about Nigeria, it is the country that we talked in the Skype-a-thon. I think it is a great form for improve our English. Thanks for prepare us activities like this. hello my name is Santi of 3A ESO. Hi I´m Juan I. Mendoza from 3º ESO. The activitie was very interesting and funny. I like a lot because we can met a lot of people of others countries and the game was interesting. I want to repeat this activitie. Hello!I am Sheila ,I'm from 3º ESO.I love doing this activity,because that's how I meet people from other countries. My class we've talked with students from Nigeria and Canada,I would like to do this activity many times. Bye!! Is very interesting the World Day Skype because I pass a good time with my friends and a practis my english. I'm Diego of 3°A of E.S.O. I think it's a fantastic idea to learn English and cultures from other countries.It's a great idea for classes not to be so boring and be fantastic. Hi, I´m Iván from 3rd ESO. We did a conection with India and it was so interesting because we saw another people from another countries, and we saw their classroom. I am Araceli Escudero from 3ªESO. I think this activity is a very good way for learning things of the cultures of countries all over the world. My name is Florentina from 3º ESO. The skype with people around the world was very interesting, I learn more things about their culture. I think this activity is really good for improving our English. In my class we talked with peo`ple of Nigeria on India, it was very funny, we song for them and they did the same. It was really nice. Hello. My name is Julian from 3*A.
I found the activity very amusing. I knew things about other countries and also felt a little frustrated trying to guess the countries where people came. I like this experience because we can connect with other cuntries, the first country in using Skype was Nigeria and the second was India. I want to repeat this experience in the near future. I like this idea and I want to repeat it again. Hello, I'm Natalia from 3°A. I like this activity because you can talked with other countries and you learn more thinks.One day we talked with India and other day with Nigeria. It's so cool. 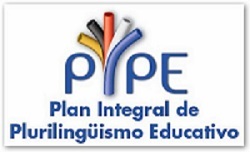 My name is Ángela Santamaría from 2ºESO A.
I think that this experience has been incredible. I have really enjoyed learning about new people from other places of the world; and it was very funny I would like to repeat it. Hello, my name is Fernando Mendoza from 2ºE.S.O. A.
I think it was an amazing experience. I really liked it because I learnt a lot. I hope do another one. Hello my name is Walter of 3A. I really like this activity because we know people from another country speaking English that was very interesting. Hi I am Daniel from 3ESO. Hi, I am Laura from 4 ESO. I think this idea is very good and I passed a fun time, with my class and the people I´ve met. I would like to repeat it. I think that this activity is very interesting because we learn a lot about other places of the world and at the same time they learn about us. I like a lot and I would like to repeat it. Hello, my name is Fernando rojas luizaga The activity we did was very fun although we did not guess a bit, but in the end we guessed it and it was fun. I think it was a good experience. I like this activity becouse this is not done every day. Hi! I’m Javier of 4º ESO and I did this activity two times so I can enjoy it the double. It was fantastic, because we learnt a lot of geography and information about other cultures. For example, we talk with one school of South Africa and other of United Emirates, and it was so funny too. I hope doing another interesting activities like this. Bye!! hi! my name is Paola from 3º A ESO. Hi! I´m Adrian of 3º ESO. I love this activity because you connect with other people of the world with skype. Apart of that you learn about geografy of that country and also learn some of their culture like typical songs or typical food. Til now we have connected with Nigeria and India. It was awesome. Bye!! hello my name is Ainhoa I´m from 3ºA ESO. I like this activitie because is very funny and you meet new people from other part of the world. I like that experience and I would like to do it again. I learned a lot with this activity. Hi, I'm Larisa from 4°ESO. This activity was the beat, we learnt a lot of things about other cultures and we had a lot of fun. Now we have friends from other countries. We have to repeat this activity. Hi, I´m Itziar from 4º ESO. I found this activity very funny and entertaining. We also learned English speaking with people from other countries. This activity was Very fumny and dificucult Because the other group won. I want to repeat this activity beacause os very imteresting.